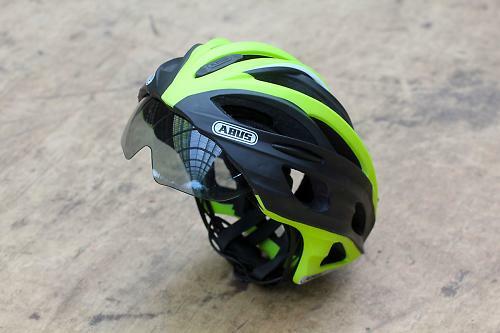 The Abus In-Vizz helmet garnered quite a bit of attention at last year's Eurobike, where it won a prestigious Gold Award for its unique retractable lens design. Whereas other visor designs tend to be fixed in place, or at least, a bit fiddly to adjust, the In-Vizz system couldn't be any simpler or more effective – a single flick of one hand is all that's needed. Moving away from the visor for a second, the rest of the helmet is pretty standard from a construction point of view. A hard outer shell is moulded to the inner EPS structure which absorbs the energy in the event of a crash. There are eleven vents in total, which deliver decent, if not outstanding, ventilation. The internal channels aren't particularly deep and are easily blocked by one's hair when wearing the helmet. You'll want to remove the foam insect mesh as well, as it effectively completely covers the frontal vents and noticeably reduces the airflow through the helmet. Where the construction does differ slightly from the norm, is that the EPS structure is actually two separate pieces bonded together – a result of having to provide a slot for the lens to retract into. Speaking of the lens, it is quite easy to remove completely from the helmet in order to clean it, or to swap to a different tint than the standard grey (clear and amber lenses are available to purchase separately). In terms of quality, the lens is noticeably inferior in quality to the recently tested Casco Speedster, but still decent enough not to negatively affect vision in any way. I'd say it's on par with a set of mid-range glasses you'd expect to pay £50-60 for. The size of the lens offers a little more peripheral coverage than sunglasses too, especially at the top which is useful when grovelling particularly hard in the gutter on that crosswind section. 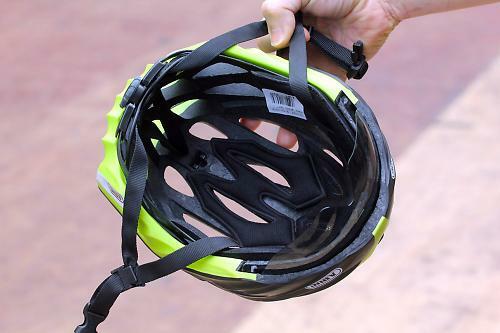 However, though Abus claim that the In-Vizz is suitable for wearers to use specs underneath, a quick test revealed that the visor sat too close to the face for this to be possible. Given that the lens retracts into the helmet itself, moving it out further from the face would require extending the frontal section of the helmet forwards, even more than it already does (3cm approximately). This may not be feasible and would certainly make it look pretty strange. The little niggles with the lens are soon put to rest when actually wearing the In-Vizz on a ride, as the freedom from having to mess about trying to find somewhere to put your sunglasses on a sweaty climb is quite liberating. It sounds a bit over the top, but I never realised how irritating sunglasses were until I got rid of them. The system is so simple, and works so well, that it never failed to put a smile on my face when I flicked the lens back into position as I crested a climb and headed down a descent. 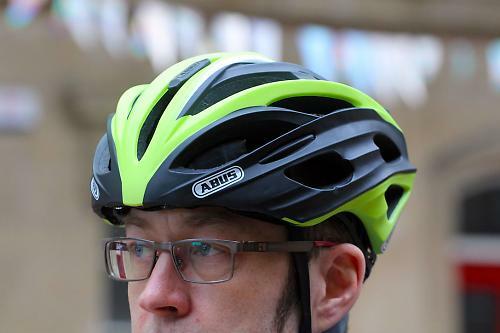 Having expounded the virtues of the retractable lens concept, it has to be said that Abus have really missed a trick when it comes to the design of the rest of the helmet, and in particular, the retention system. 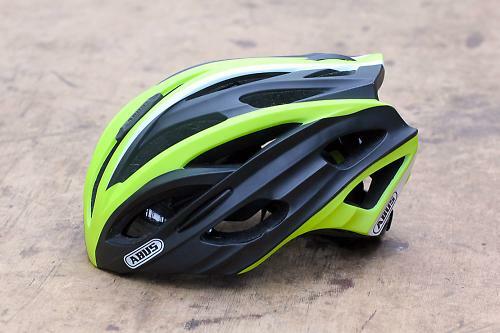 From the poor build quality, exemplified by a rear adjusting dial that emits a plastic-y squeak when turned, as if the tolerances aren't quite up to scratch, you'd never guess that this was a £130 helmet. At that sort of price, you expect something better – a dial that offers a smooth action with positive sounding clicks to let you know exactly have much you've tightened it. Though Abus claim that the retention system is vertically adjustable, the reality is that the design affords only a minimal range of adjustability. Comparing it to most of its competition in this price range, it falls quite a way short. And that's a real shame, because the lens design really is unique and a genuine improvement over sunglasses or a fixed visor, but it feels like the designers have neglected other aspects of the helmet, and forgotten that customers expect quality when shelling out £130. In addition to the 'race green' colour tested, the In-Vizz is also available in white, and black and you can also buy a purpose-made rain cover for it. Great concept: the retractable visor design is truly innovative and works great in practice, but the In-Vizz as a whole is let down by poor execution. 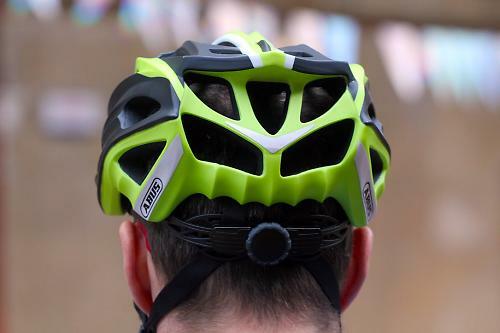 The In-Vizz is a top-end helmet with a retractable visor, suitable for both road and off-road riding. It will probably appeal most to those who suffer from a sweaty brow as the retractable design means that the lens won't get fouled up. The construction feels cheap for a helmet in this price range. The adjustment dial is squeaky and offered a very poor feel. Excellent design and execution of the visor system which was very easy to use and offered a real improvement over traditional sunglasses, but the retention system could be better. It's spent quite a bit of time travelling loose in a bike box and so far seems to have fared well. Reasonable considering the integration and added weight of the visor. Overall, nothing to complain about, but the retention system could have more vertical adjustability for those that prefer a more cradling feel. Ventillation is ok. The quality of construction is not what you'd expect at this price. Overall performance was good and the concept is a genuine step forward. Would you consider buying the product? Not until some of the issues are sorted out. Just a quick comment on the glasses/visor issue: the visor did fit over my specs (just) but not others we tried. if your glasses are fairly low profile, or wrap around your face, you'll probably be okay. Could we have a full side by side comparison between this and the new Casco and Kask Lifestyle helmets with similar visors please? With particular attention to the specs wearer - these are all expensive helmets, but if the visor works, could be cheaper than a pair of cycling-specific sunglasses with full varifocal prescription.